I've often wondered about the photo of “Old Three Toes,” above, which belonged to my Uncle Joe. The photo is apparently of a museum exhibit, and Old Three Toes was actually mounted and on display. What was the significance of this wolf? I knew from the family that Three Toes used to wander South Dakota not far from Thunder Butte. 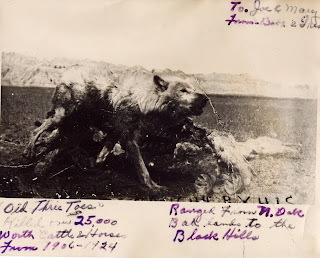 During the early 1920's, Old Three Toes of Harding County was thought to be the last wolf left in the Tri-State area around Thunder Butte, and was credited with any predator related attacks on local livestock. The gray wolf used to roam the plains, living off of the buffalo, antelope, and other animals that were wild to the prairie. With the die off of the wild bison from over hunting and the introduction of livestock into the area by homesteaders, wolves soon adapted and began preying on the cattle and sheep living in areas like northwestern South Dakota. It's difficult to imagine today, but wolves were once considered such a threat to ranchers that extensive government control programs and wolfers worked to drive this animal to local extinction on the prairie and in much of the West. “The most noted outlaw wolf in northwestern South Dakota was Old Three Toes. By 1912, his big three-toed track was plain in dusty sheep corrals where dead lambs were strewn about uneaten. He became known as a killer who seemed to kill for the sport of it. One night he killed many sheep and lambs at three different ranches, but ate only the liver of one lamb. He was killing livestock, including saddle horses and steers at a cost of $1,000 a month when caught by a government hunter in 1925. His mate had been killed in 1920, and after that he hunted alone. Another source on the web recounts how the end came for Old Three Toes -- "He was over 20 years old when he was finally trapped July 23, 1925, in the Kahoun pasture, near Gallup, SD, by Clyde F. Briggs, deputy predatory animal inspector for South Dak­ota. The animal was still alive when discovered in the trap, and an effort was made to take him to Buffalo, the county seat, before killing him, but he died before reaching that town. He was 6 feet long and weighed between 75 and 80 pounds." 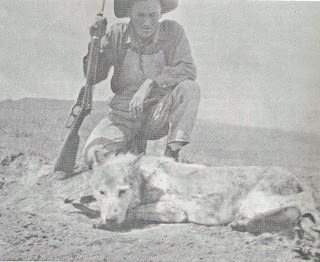 The photo below shows Briggs pictured with the dead wolf. Whether Old Three Toes' renown is actually deserved or not, the reintroduction of Canadian gray wolves into Idaho, Montana, and Wyoming has caused great controversy, as wolves are an intelligent predator and still seen by many ranchers as a potential threat to their way of life. Wouldn't be wonderful, though, to find some way to co-exist with these remarkable creatures? Miquel- Old Three Toes hide and body alledgedly went down towards Pierre, where they were lost, stolen what ever, according to the Museum in Buffalo, as of 2001. My Grand Father hunted him, along witrh my great Grand Father, when they traveled back and forth from Terry, Montana homesteads to the old place 16 miles north of Mitchell, South Dakota. This was 1914-1917 and 1919-1922, interrupted by having to fight the Kaiser, and ended by marriage to my Grand Mother and settling down. My grandfather grew up in the Cave Hills of South Dakota. His father and uncles lost lambs to three toes and hunted him. Three Toe's stories are notorious in our family. Part of the tradition that binds 4 generations together. My Mother tells this story about "three toes" in a letter to me about their family homestead ranch in Harding County, S.D. The Lahti ranch located ten miles northwest of Buffalo was established by J. O. Lahti who emigrated from Kemijarvi, Finland. He came to America in l882 and worked in mines in Michigan and Montana coming to the Black Hills in 1887 to work in the Homestake Gold Mine in Lead, SD. He married Alma Peltoma from Oulun, Finland in 1893. In 1898 Jacob went to the Klondike to the Alaskan Gold Rush where he stayed two years. J. O. made a stake in Alaska returning to SD where he began ranching in the East Short Pine Hills with John Nell and John Waara. Lahtis resided in the Short Pine Hills until 1905 when they homesteaded and established the ranch northwest of Buffalo. The Lahti ranch was one of the haunts of the notorious livestock killing wolf "Three Toes". The following is a quote from an article written about Three Toes. "He seemed to hate the Lahti ranch hitting that place often. In 1922 he killed 34 head of registered rams out of Lahti's buck pasture. Lahti had recently purchased them at $35 a head and thought they would be safe because of their gnarled horns. But within a months time Three Toes had killed everyone of them." My Great Grandfather died in 2004. The year before he died he told this story to us. One of the men that lost his sheep to Ol' Three Toes was a brother to a man that did business with my grandfather. When he told my mom, my brother, and I that story there was a certain twinkle in his eye and it was like I was there. The way that he told us was that this lone wolf went out and killed 32 sheep every night and never ate them, just drank the blood. I was so interested that I started to research it and sure enough found this web site. Personally, I love this story and I think that it is so much better than any fairy tale ever written, and its even cooler because it is true. Clyde Briggs was a man that I have always know as Uncle Clyde. He and his wife settle in Bergman, Ark. I visited their home often. My mother, who is in her early 80's, recounts the story of Three Toes to me at least once a week. Uncle Clyde even gave her one of the traps that he used in capturing Three Toes.